The Christian community is clearly divided, on many topics. What is the cause of such division? Is all disagreement division? How can we solve this problem? There are core principles which define the Christian faith, such that there is a necessary division between Christianity and other faiths. But all religions have divisions, and this is largely because all religions are composed of people. People disagree at least as much as they agree, and no creed or philosophy or even faith can change fallible human beings into perfect and all-knowing ones. As long as we are on this earth, we will disagree. The core and identifying principle of the Christian faith is that Jesus is as the Bible describes him: a Person of God who took on human flesh, died for our sins, and rose again (Phil. 2:5-11). To put all one’s faith and trust in this Jesus is to be saved, which means to be reconciled to God and spend eternity with God. To be reconciled is to be on good terms, to have a close relationship, to walk together. If this is what a person wants, they must accept the Jesus who rose from the dead. No deviation from this belief can be compatible with the Christian faith. There are certain beliefs and behaviors that stem necessarily from that core, such that failure to have or exhibit them calls into question one’s sincerity in professing the Christian faith. For example, we read in such passages as 1 Cor. 13 that without love, other attributes are worthless. And we read in Gal. 5 that there is to be a clear division between evil deeds and good deeds. Further, we read in Rom. 6:2 and Col. 2:20 that Christians must consider themselves dead to sin but alive to God. So the professing Christian who lives in sin is internally divided and should be a matter of grave concern for the Christian community. In fact, there is clear teaching in the New Testament that such who are unrepentant must be expelled from fellowship (1 Cor. 5:5, 1 Tim. 1:20). Beyond the core of our faith and the necessary beliefs and behaviors that stem from it, there is room for differences of opinion or “disputable matters” (Rom. 14:1ff, 1 Cor. 6:7). Paul wrote much about needless divisions in the Christian community (1 Cor. 1:10, 11:18), such as arguments over which leader they followed, whether Gentiles were on the same level as Jews, observance of rituals, festivals, and sacred days, and what freedom in Christ meant in regards to sin. But the common thread through all of those divisions was that they showed a lack of spiritual maturity (1 Cor. 3:1-3, Gal. 5:22-23). Mature Christians do not concern themselves about who is in charge of whom, or which local congregation is larger or more prosperous than the rest. In fact, the hallmark of spiritual maturity is humility (Luke 22:26), which is one of the qualities of love (1 Cor. 13:4-5). To think oneself entitled for any reason is to exhibit spiritual immaturity (Rom. 12:3). There are topics that have wreaked havoc on the Christian community in recent times. These include security of salvation, predestination, Bible translations, racism and sexism, forbidding negativity, and prophecy. Let us briefly examine each of these. There is no evidence that Conditional Security (CS) advocates live sinlessly, or that Eternal Security (ES) advocates live in sin. There is no detectable difference between someone who is saved, lost, and resaved (CS), and someone who is saved, backslidden, and restored (ES). If people in either group are continually lapsing into sin and repenting, the greater question is the sin, not the mechanics of restoration. Something is terribly wrong with their relationship to Jesus. Fighting and condemning each other over this issue is evidence that neither side has a grasp of what it means to be reconciled and to grow spiritually. Either extreme is a bad way to live. The CS person may worry needlessly over every slip and think of God as always looking for an excuse to reject them. The ES person may think of God as only loving and not holy, and so not grasp the seriousness of sin. It’s pointless to argue about it, since we cannot affect the decision God made in eternity past. Like the security of salvation debate, arguing about it or condemning others about it shows spiritual immaturity. The gospel message is the same as that of those who do not agree with this belief, since no one knows whom God has already chosen. There is no detectable difference between Christians persevering because they’re saved, or being saved because they persevere. It makes no difference in the daily life of any Christian. There are many who believe that only one English translation of the Bible is valid, and that all others are works of the devil. What effect does this belief have on the Christian community? It is an overt teaching of division that cannot be supported by scripture in any translation or even the original languages. It presumes, without scriptural warrant, to judge a person’s salvation by that criterion alone. It slanders the motives of translators who produce other translations, without sufficient evidence. It portrays God as more of an accountant or lawyer than love and light, by overemphasizing meticulous detail and deemphasizing core principles of love and mercy. It elevates itself above the rest of the Christian community as equal to divine authority. These two very closely related topics are more examples of the overt teaching of division. In fact, division is the heart of the teaching, and on the basis of the flesh. How do these flesh-based teachings divide the Christian community? As noted, they make Christianity more about flesh than spirit; flesh carries primary importance. They violate explicit scripture against them, e.g. 1 Sam. 16:7, Gal. 3:28, James 2:9. Instructions on how Christians should conduct themselves in a society that practices racial and/or sexual hierarchy do not constitute divine endorsement of such practices; e.g. 1 Cor. 7:21,23. Specific instructions for concession to society, as listed above, can never overturn core principles such as humility. The examples of Jesus and Paul are to lay privilege aside (e.g. 1 Cor. 9:12, 2 Thes. 3:9), such that even if a Christian believes God granted it, they must not keep it. The history of the practice of Christianity is, among other things, a study in extremes. One era might be characterized by doctrine at the expense of spirit, and another by the opposite. One might be a time in which Christians are bold and unfazed by criticism, and another a time when Christians are more concerned with judgment of the words and actions of each other than with saving the lost. This phenomenon, which we might call “Christian political correctness”, has become a divisive force that seeks unity through forced conformity. Is this justified? Does unity trump everything else? Is it really bringing unity or is it actually causing division? Those who speak out against negativity almost always do so in a very negative and critical manner. The judgment of where to draw the line on negativity is arbitrary and biased, and it presumes to have the only acceptable definition. Public condemnation of someone for being negative serves only to cause Christianity to be mocked, and it publicly shames a fellow believer who should have been spoken to privately. Overbearing control over the speech and actions of fellow believers never results in unity but only drives people farther apart. The stifling of difference of opinion is as unhealthy for the Christian community as it is for a nation. Given the times in which we live, prophecy is being widely discussed today, even by non-Christians. But discussion of the details increasingly results in Christians condemning, mocking, and belittling each other, often over a mere difference in a few years over the timing of Jesus’ return. Does this make the study of Bible prophecy a teaching of division? Not at all. But it does show that Christians often elevate secondary matters to primary. In what ways do Christians abuse and distort discussions of Bible prophecy? Beyond our hope and trust in Jesus’ promise to return, details about the timing are not a salvation issue. Presuming that belief in a certain timing is dangerous or even demonic, and that people who believe it are minions of Satan, is egotistical and judgmental, not to mention divisive. It is not the disagreement that divides, but the condemnation. As with other topics, the public bickering of Christians over prophecy minutiae is a very bad witness. Humility teaches us that we are all fallible, and that we all imperfectly interpret scripture. Prophecy is supposed to give us hope, not cause fear or teach self-reliance rather than Spirit-reliance. 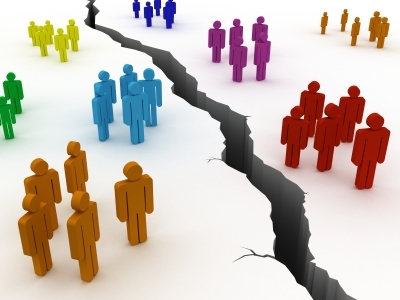 What can the Christian community do to close and heal these divisions? First of all, a return to basics: we must continually remind ourselves about the core principles of the faith and the behaviors that necessarily flow from them. We must humble ourselves, because a humble person is not bent on controlling or correcting others. Rather, we should live the example of the kind of person we think others should be. We wouldn’t become angry with others for not conforming, but instead pray for them and simply express our opinions and let the Holy Spirit do the work in their hearts.